Nicole's Needlework: Elizabeth J M Mears Finished! 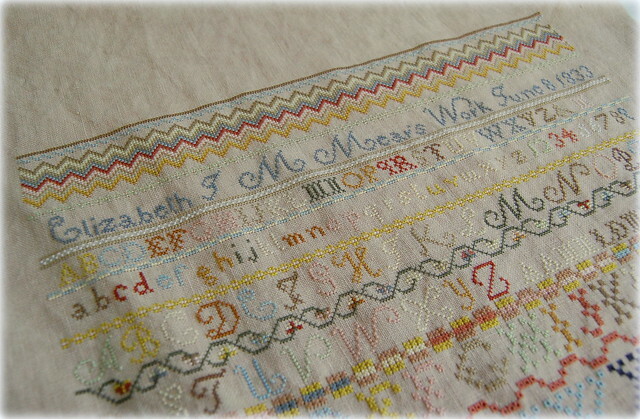 Queenstown Sampler Designs "Elizabeth J M Mears 1833"
Not sure what I'm going to work on now. I may get back to Elizabeth Sheffield or start something new! Hope you all have a great weekend! You do such beautiful work! I am in awe of the number of your projects. This sampler is gorgeous!!! It's AMAZING!! Beautiful, i am speechless! Looks great! I keep debating on doing this one. And debating and debating! But yours is beautiful! It is absolutely gorgeous. Seeing your finish makes me want to start it. Stunning! What an accomplishment. The amount of work is numbing and the result is spectacular. Nicole this is just gorgeous!! I am so happy for you getting it all finished up. You get so much done! I need to get to stitching today too. Looking forward to your next project! Congratulations! It's a wonderful finish! What a great finish. That building was reallly a challenge...looks great. Congratulations. It is gorgeous! Can't wait to see what you start next. Truly Amazing. What patience you have. Enjoy the fruits of your labor. My goodness but you are a prolific stitcher- congratulations to you on another huge piece completed! It is just sooooo gorgeous, Nicole!!! I just love it! I so need to stitch this one! Huge congratulations! 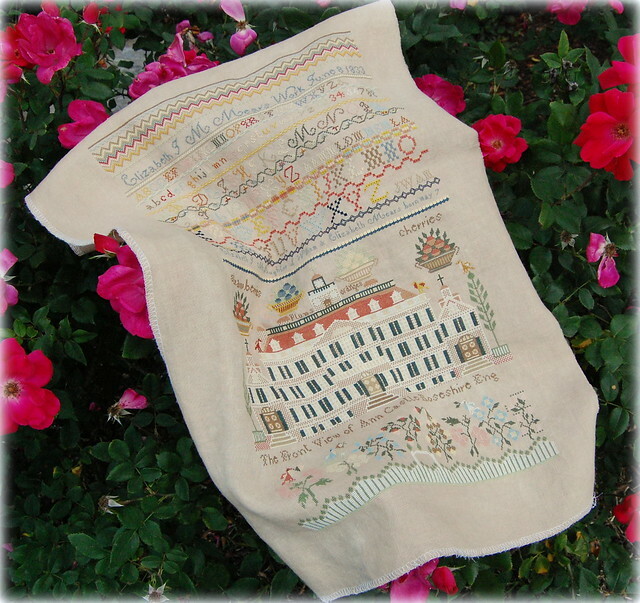 Congrats, Nicole, on this beautiful (and huge) sampler!! You are right that zigzag area took forever, but isn't it wonderful? Nicole, it is an amazingly gorgeous finish! Congrats! Congratulations on a gorgeous finish!!! That is beautiful Nicole....great job! I would have lost my mind on that house alone. It is sooo beautiful!! I really want to stitch this one! Oh Nicola that is such a wonderful finish! you must be very pleased, that house is just fantastic! Congratulations, Nicole! "Elizabeth" is absolutely beautiful!!! Everything about her is beautiful...the alphabets, the colors, the zigzags, your lovely stitching. You should be very proud! Nicole, your "Elizabeth" is phenomenal! What an accomplishment! I'm anxious to see it framed. WOW!!!!!!! Just gorgeous! Very impressive. I am sure you are doing a happy dance!!! Absolutely gorgeous!!!! I love it and huge congrats. Oh my gosh, Nicole! What a stunning piece of work! You must be absolutely thrilled and oh, so proud! What a lot of time went into this stunner; I can't wait to see it framed! Oh my gosh Nicole...Elizabeth is STUNNING !! Excellent finish. Your work is amazing. Fabulous finish! Congrats to you! She's stunning, Nicole! Congratulations on a gorgeous finish! Woohoo! You finished it! Congratulations, Nicole. It is gorgeous. I hope you frame this one. Can't wait to see what you take on next! What a beautiful sampler. That house might have gotten the best of me. :-) Congratulations on another great finish! Bravo!! Congratulations on your gorgeous finish. STUNNING finish Nicole! All the details are just beautiful. Breathtaking finish! I'm just in awe. Congratulations! Gorgeous - such a detailed pattern - you did a fantastic job - congratulations! Gorgeous!!! Another beautiful finish, Nicole! What an accomplishment!! Congrats! Congratulations, it is a gorgeous finish! Congratulations, it really is a stunning finish, and quite an accomplishment. A fantastic finish! Such a beauty! Can't wait to see it framed. Congrats on an awesome finish Nicole. Elizabeth M. looks fantastic. Wow, wow, WOW! It's gorgeous! Congratulations on finishing this huge piece. It's on my wishlist, but I can't imagine finishing something that big. I'm so impressed that you did the whole thing, and in pretty good time, too! She is gorgeous, Nicole!!! Absolutely stunning! 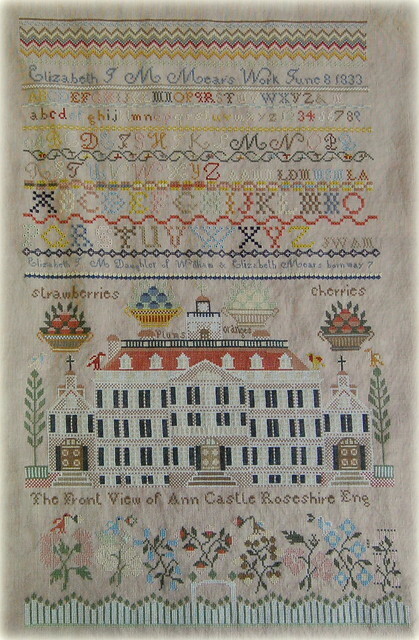 I can't believe how quickly you stitched this one up - especially with that big building - that's a ton of stitching!! Congrats on the finish! Incredible! She is so beautiful. Congrats on finishing. Simply gorgeous! Well done on the finish! Holy cow, she's gorgeous! That will be so pretty hanging anywhere - this just bumped it up on my wish list :) Congratulations on the finish! Wow, that's beautiful! I aspire to finish something like this one day! Wow!! She is stunning!! Can't wait to see her in a frame!!! Congrats!!! Big happy dance for you!! Breathtaking! Such beautiful work, Nicole. It is lovely - great job! WOW Congratulations on your big beautiful finish. Absolutely gorgeous! Congratulations on such a great finish!